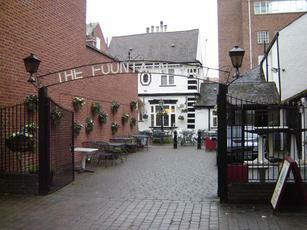 The Fountain, like a number of other local pub is situated in a courtyard off a main street in the centre of the city. It had a surprisingly decent range of real ales - Wickwar Bob, Butcombe Bitter, Bristol Beer Factory Independence, St Austell Tribute, Dartmoor Jail Ale, Hillside Legless Cow & Timothy Taylor Landlord. Unfortunately there were no dark ales and no real cider either. Despite this, it I definitely one of the better pubs in the city. Gorgeous old coaching inn on the main drag in Gloucester. It is a nice environment but crucially the owners haven't used its prime location and history to excuse themselves of putting in any effort and instead you have welcoming and efficient staff, good food, a wide (and from the pump labels on display on one of the walls) constantly changing range of real ales supplemented by a choice of lagers and bottled beers. The prices were on a par for the area and the quality of the pints was very high. If pushed I'd say that The Pelican is the only pub I visited in the area which beats it for beer quality, but that overall this was my favourite pub I drank in when I was in town. I would say that both this place an The Pelican qualify as "must-sees" if you are in Gloucester and enjoy a pint in a high quality pub. 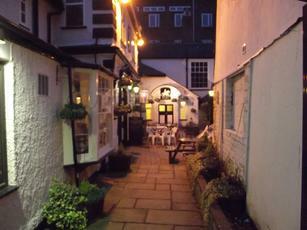 Historic coaching inn with adult and calm punters the evening I visited. Friendly staff. Decent cask ales on. Did not eat. 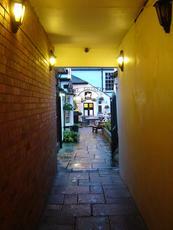 A "must" pub to visit when in Gloucester. This is a solid 7 out of 10 pub to me. It naturally caters for shoppers/tourists but the staff were fine, the prices reasonable and the beer good in both choice and quality. The smell of cooking that suddenly wafted in from nowhere was a bit off-putting but that's what happens when you drink at lunchtime.